﻿ John 14:1 "Do not let your heart be troubled; believe in God, believe also in Me. 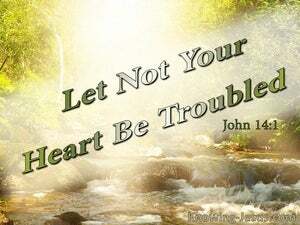 "Don't let your hearts be troubled. Believe in God, believe also in me. Let not your heart be troubled. Ye believe in God, believe also in me. Let not your heart be troubled: believe in God, believe also in me. Do not let your hearts be troubled (distressed, agitated). You believe in and adhere to and trust in and rely on God; believe in and adhere to and trust in and rely also on Me. [Jesus continued], "Do not allow your hearts to be upset. You should believe in God, and believe in me also. Let not your heart be troubled; believe in God; believe also in me. Let not your heart be troubled: have faith in God and have faith in me. Let not your heart be troubled: you trust in God, trust also in me. "Your minds must not be troubled; you must believe in God, and believe in me. Let not your heart be troubled: believe in God: believe also in me. Let not your heart be troubled: believe in God, and believe in me. Let not your heart be troubled: you believe in God, believe also in me. Let not your heart be troubled. You believe in God, believe also in Me. And he said unto his disciples, "Let not your hearts be troubled: believe in God, and believe in me. Let not your hearts be disquieted; you believe ? ?believe in God and also in me. 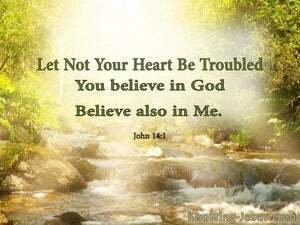 "Let not your hearts be troubled. You trust in God, trust in me also. "Do not let your hearts be distressed. You believe in God; believe also in me. "Do not let your heart be troubled. Believe in God. Believe also in me. Let not your heart be troubled. Have faith in God, and have faith in me. Let not your hearts be troubled; believe in God and believe in me. Let not your heart be troubled: Believe on God, and, on me, believe. LET not your hearts be troubled: trust in God, and trust in me. Do not let your hearts be troubled. Believe in God; believe also in me. 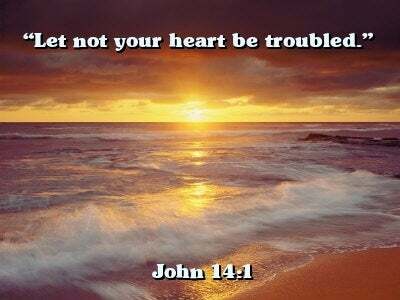 "Let not your hearts be troubled. Trust in God: trust in me also. "Stop letting your hearts be troubled; keep on believing in God, and also in me. "Don't let your heart be troubled. Believe in God. Believe also in me. "Let not your heart be troubled: believe in God, believe also in Me. 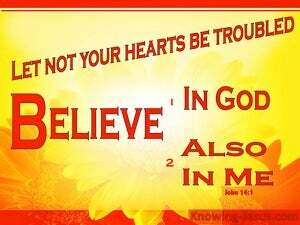 1 "Do not let your heart be troubled; believe in God, believe also in Me. 2 "In My Father's house are many dwelling places; if it were not so, I would have told you; for I go to prepare a place for you. "Therefore, I would be dismayed at His presence; When I consider, I am terrified of Him. The LORD will command His lovingkindness in the daytime; And His song will be with me in the night, A prayer to the God of my life. Then I said, "It is my grief, That the right hand of the Most High has changed." My sorrow is beyond healing, My heart is faint within me! My soul has been rejected from peace; I have forgotten happiness. "For this is the will of My Father, that everyone who beholds the Son and believes in Him will have eternal life, and I Myself will raise him up on the last day." "From now on I am telling you before it comes to pass, so that when it does occur, you may believe that I am He. to the end that we who were the first to hope in Christ would be to the praise of His glory. so that no one would be disturbed by these afflictions; for you yourselves know that we have been destined for this. that you not be quickly shaken from your composure or be disturbed either by a spirit or a message or a letter as if from us, to the effect that the day of the Lord has come. "As for me, is my complaint to man? And why should I not be impatient?